Climate. AI. Government. The future won't look like the past. We need to think different. This is Climate | Money | Policy. A collection of writings by Brian Reynolds. Brian is a former candidate for the United States Congress, a United Nations credentialed climate change authority, an entrepreneur with a history in a wide variety of businesses. Here you can find his blog, appearances, and contact him for consulting/events/press. Climate|Money|Policy is a blog about the intersection of business, government, and the critical issues of the future like climate change, A.I., and the balance between inequality and personal responsibility. It’s authored by Brian Reynolds. a former candidate for the United States Congress, a United Nations credentialed climate change authority, an entrepreneur with a history in a wide variety of businesses. The Climate/Business Disruption- how climate change is a threat not to a business but to all business. Part 1: A New Kind of Disruption. Responsible managers look at their operations with a critical eye. They expect the conditions they operate under to change. Maybe not today, maybe not tomorrow but conditions will change and the longer it takes for that to happen the more dramatic the change is likely to be. If you work in the mid-market, it's likely the case that you're not employed by a company with a large, dedicated risk-management team. It may be that your company is of a size where only the CEO or CFO is responsible for the "What if...? "s of strategy. Assuming that's the case let's get the basics of risk management on the table. There are two classes of risk plans: Probabilistic plans and scenario-based plans. If you were throwing a fund-raiser in an outdoor space all of your contingency planning falls in line with what the likely outcomes could be. Could it rain that day? What if it's too hot or too cold or too windy? These are all likely to happen and the amount of time you spend planning around them is in relation to the best guess you make from the data about what will happen. That's probabilistic risk management. At the same time there are possibilities which carry so much threat, so much downside risk that you game them out in advance. In our example, you have a plan for getting your guests to safety if there's a fire or a heart-attack during the event. 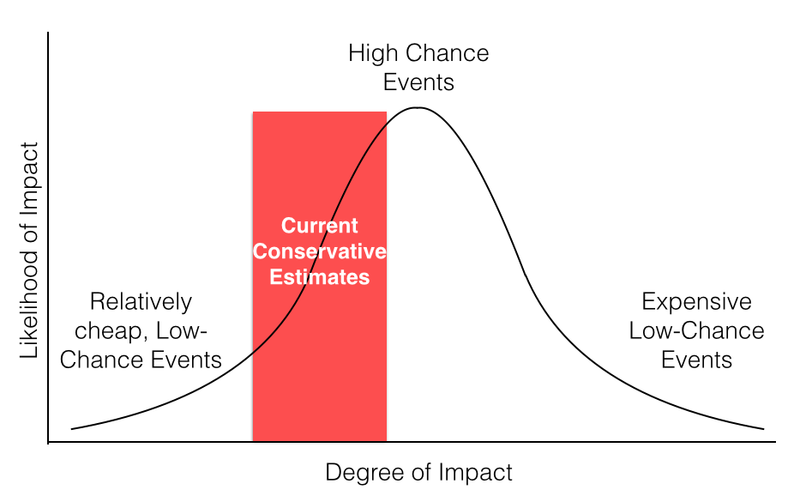 This is risk management by scenario. You don't expect something to happen but you should be prepared to deal with it. The point here is that climate disruptions were considered a scenario ten years ago. Now however, they live on a range of probabilities somewhere between "Will-happen & we're prepared" and "May happen & we can't prepare". As a responsible manager it's incumbent on you to make a judgment on how to respond to different levels of severity in global warming because it's currently unknown what the final outcome will be. Remember the end of Star Wars? Luke in the X-wing trying to blow up the Death Star? This is the perfect example of two key factors in risk assessment: vulnerability and exposure. The Death Star has very little exposure to damage (just that one little port to shoot) but is incredibly vulnerable if shot (blows up completely). On the other hand a red-light camera creates huge exposure to a traffic ticket (it gets you every time) but little vulnerability to damage (a fine, unless you've done something else). Most companies hedge their risks by decreasing their exposure or their vulnerability as I mentioned at the top. On a warmer world that won't work. The problem faced by the business community is that of all the kinds of risk that get modeled, climate risks are the most difficult. Climate risks change the operation of a marketplace by definition. In traditional modeling, you try to contain a scenario to one or two different variables and in a sense you can do that with climate: How much hotter will it get? A retailer throws a small sale on a single item. The retailer gets more traffic but essentially needs to make no changes for the event. If the same retailer has a big sale for lots of items s/he needs more cashiers, more stockers, additional help with security, the building AC needs to be turned up, the power bill will be greater, people are needed to direct traffic, and contingencies are required for plumbers, carpenters, doctors, and police. Meanwhile the receiving of new product and entertaining of new suppliers has been complicated. This marketplace has been altered fundamentally. Trying to model for climate change is like trying to model for the big sale. We know it's happening. We know lots of systems are going to be taxed. What we don't know is how stresses on any one system will constrain all of the others. As a practical matter that means that whatever risk management your company chooses to engage in will ultimately not account for risks past a certain point. Yet there are still things that are wise to consider. Start with emigration patterns, the cost of labor, utility costs, expected future taxes (to pay for infrastructure and disaster spending), not to mention insurance and property issues to name a few. Beyond that prudent companies start looking for ways to care for the marketplace not just his/her clients. Why? Because the market itself is the most valuable business asset available. America and Europe are the wealthiest nations in the world not because we have the best workers or the most entrepreneurs or the the best tax policies. Business thrive in the western world because here the marketplace itself is a smooth and predictable thing. The lights turn on when they should, the governments outlive election cycles and the rule of law can be relied on for almost all of the people almost all of the time. That certainty is required for a robust marketplace to thrive. Global Warming, can be addressed properly with the sound principles of risk management. By doing so the marketplace will be stressed but the system that market operates under won't be threatened. Left unchecked however, that can't be guaranteed. If Las Vegas can't get enough water, trust and predictability evaporate. If Miami begins to drown, insurers will exit that market. How many times can the Carolina barrier islands or Kansas corn fields be rebuilt before the rest of the nation cuts off funding? There is a limit past which the system can't be strained. But it's not all doom and gloom. In fact the one community that has yet to weigh in heavily on the side of managing the climate is the the business world and the responsible managers who run it. The next post will compare and contrast the business community to government and the individual, making the case for why it's industry that will lead the charge in resolving the climate crisis. What do you think? Please leave a comment. Profit, not panic. Global warming presents unique challenges in areas that business school never taught managers to measure, monitor and control for. Here we break those down, work them over and educate so that your organization can move forward with a realistic understanding of the challenges ahead and a clear plan on how to use them in your vision of the future. Get the blog as an email. It publishes a few times weekly and takes about 2-3 minutes to read. Thank you for subscribing to the blog. I take privacy pretty seriously so your info will never be shared with anyone. Ever. Share C|M|P with other people it makes a big difference.